A study published January, 2018, in the Neurology Journal found that eating some kinds of vegetables with green leaves significantly prevented cognitive decline in seniors. In fact, those that ate the highest amount of greens were found to be 11 years cognitively younger than those who ate less. The study followed 960 seniors between the ages of 58-99 in the Memory and Aging Project for almost five years. The three green leafy vegetables used in the study were raw lettuce, cooked spinach and cooked kale/collards. These three vegetables contain the following nutrients: phylloquinone (Vitamin K), lutein (carotenoid related to Vitamin A), β-carotene (carotenoid that leads to the formation of Vitamin A), nitrate (inorganic nitrate salt), folate (a water-soluble B vitamin), kaempferol (a natural flavonoid), and α-tocopherol (Vitamin E307). These vegetables were chosen because previous studies also reported that they had benefits to protect the brain. All of these nutrients except for B carotene were also individually studied and were found to be neuroprotective. Romaine Lettuce is a popular salad vegetable mainly eaten fresh and raw and has many good vitamins and minerals. A study in 2010 showed that Romaine lettuce had neuroprotective anti-oxidative and phenolic properties. 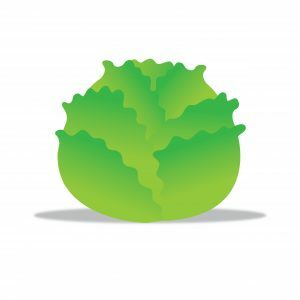 Even though other green vegetables are higher in neuroprotective phenolics and antioxidative properties than Romaine lettuce, lettuce was included in the study because it is more commonly eaten in larger amounts than those other vegetables. Spinach is a nutritious vegetable that also contains many beneficial minerals and vitamins. However, even though spinach contains a lot of iron and calcium, spinach also contains oxalic acid (oxalate), which can prevent the absorption of calcium and iron. Eating foods with too much oxalic acid can also lead to the formation of kidney stones, so spinach must be avoided by seniors who suffer from kidney stones. Kale is a member of the Brassica family that also includes broccoli, cauliflower and cabbage. Kale is considered a super food because it contains so many vitamins and minerals like calcium, phosphorus, magnesium, potassium, iron and vitamins A, C and K. However, kale should not be eaten raw, but cooked, as eating too much raw kale or other Brassica vegetables can lead to thyroid problems. Cooking destroys the glucosinolates that can interfere with thyroid function. Many seniors first show mild cognitive impairment (MCI) which can remain this way or continue to decline into dementia and Alzheimer’s. By adding at least one serving of green vegetables daily they may be able to arrest the downward road to full dementia. While more research is planned, these particular greens should be added to diets of all seniors. However, the vegetables tested all contained Vitamin K (phylloquinone), which helps in the absorption of calcium and helps to protect bones. Vitamin K helps the blood to clot and protects against excessive bleeding and this can stop blood thinning medications like warfarin (Coumadin) or other blood thinning medicines from working properly to prevent blood clots. Seniors who take blood thinning medications should consult their doctor to find out exactly what quantity of green leafy vegetables that contain Vitamin K can be safely eaten on a daily basis. Also seniors taking beta-blockers should consult with their doctors to see what quantities of high potassium foods, like green vegetables can be taken together with beta blockers. Since cognitive decline, if not stopped, can sometimes continue to full dementia and Alzheimer’s, this news about the neuroprotective qualities of green vegetables should be welcome to all seniors, caregivers and nutritionists.